Bill Tutte was born on May 14, 1917 in Newmarket, England. In 1935, he began studying at Trinity College, Cambridge reading natural sciences specializing in chemistry. After completing a master’s degree in chemistry in 1940, he was recruited to work at Bletchley Park as one of an elite group of codebreakers that included Alan Turing. While there, Tutte performed “one of the greatest intellectual feats of the Second World War.” Returning to Cambridge in 1945, he completed a Ph.D. in mathematics in 1948. Thereafter, he worked in Canada, first in Toronto and then as a founding member of the Department of Combinatorics and Optimization at the University of Waterloo. His contributions to graph theory alone mark him as arguably the twentieth century’s leading researcher in that subject. He also made groundbreaking contributions to matroid theory including proving the first excluded-minor theorems for matroids, one of which generalized Kuratowski’s Theorem. He extended Menger’s Theorem to matroids and laid the foundations for structural matroid theory. In addition, he introduced the Tutte polynomial for graphs and extended it and some relatives to matroids. 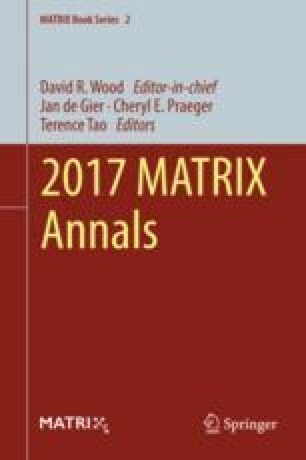 This paper will highlight some of his many contributions focusing particularly on those to matroid theory. Part of this paper was presented by the second author at the Tutte Centenary Retreat (https://www.matrix-inst.org.au/events/tutte-centenary-retreat/) held at the MAThematical Research Institute (MATRIx), Creswick, Victoria, Australia, 26 Nov. to 2 Dec. 2017. The authors gratefully acknowledge the support of MATRIx for this retreat.